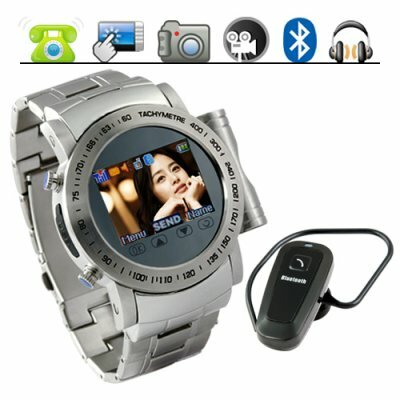 Successfully Added Gauntlet - Stainless Steel Quad Band Watchphone + MP4 to your Shopping Cart. The Gauntlet reaches a new level of style and performance. This ultra stylish watch phone is jam packed with all the features you would expect in a top of the line cellphone but in a convenient watch form factor. The Gauntlet comes with a built in camera, Bluetooth ear piece, 1GB mini SD card, video camera, FM radio and quad band GSM connectivity. When most watchphones would have ended their features list here, the Gauntlet continues to amaze us with its impressive array of useful features. If you thought touchscreen was only for mobile phones then think again. This brilliant gadget has a colorful 1.3 color touch screen that is surprisingly simple to navigate and can be easily accessed even without the use of the built in stylus! The touchscreen is pressure sensitive and responds to your command quickly and without fault. This is truly a high quality screen that performs just as well as the big boys! The Gauntlet functions as a portable mp4 player as well. With the built in media player you are able to effortlessly play your favorite music, movies or pictures, all with the simple tap of the touch screen! Just plug this watch phone into your computer via USB cable and load your favorite media files onto the mini SD card. The audio can be played through the included Bluetooth earpiece set, wired earphones or directly through the built in speaker. The choice is yours. When it comes to build quality the Gauntlet makes no compromises. This elegant 160 gram watch is constructed using only top grade materials such as stainless steel casing and wrist band as well as high quality electronics and crystal clear touchscreen. The feel of this watch is the same you would expect from watches costing more than 5x the amount. Solid build quality, beautiful looks and fully functional electronics make for an unbeatable combination of quality, style and convenience that is sure to set the standard for high quality watchphones. Since The Gauntlet supports all four GSM frequencies so you can use this watchphone anywhere in the world and remain confident that it will always work. Additional features include a calendar, to do list, text document (.txt) reader, alarm clock, WAP internet and sound recorder. This watchphone has it all! Order one today or buy some in bulk for the perfect eBay resell item! The Gauntlet is in stock and ready for immediate shipment. Brought to you by the leaders in high quality wholesale electronics, Chinavasion! NOTE: NOTE: This GSM product is compatible with the four frequencies of 850MHz, 900MHz, 1800MHz, 1900MHz. It can be used throughout the world. on 2010-12-04 08:42:11 AWESOME WATCH--My daughter is THRILLED!!! She had it up and running and showing me all the in's and out's of this most very well built watch. very easy to work and understand--Thank you for making my year!!! The phone is capital! I like to listen Andrea Boccelli and Sarah Brightman. All my surrounding is little pixilated of this unexpected phone for them/. I mean all the features are great! on 2010-08-03 21:18:07 recieved today!! At last, i fineally recieved my watch today. the watch is (a little bit) bigger than expected. but its f..... amazing! i'll get jused to the size. i'll have to figure things out bud, who cares. its very nice!! on 2010-07-29 04:00:51 Watch is on the way! Just got the news, that my order is on the way. i can't wait!! It looks great and what i heard so know it's perfect. I also want to say, that what u read about the customerservice is great, is so true. I realy like chinavasion a lot. My watch will be deliverd 30 juli, so i'll write some more review than.